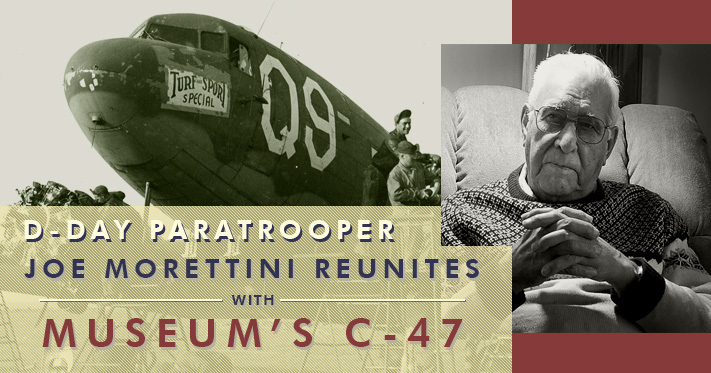 On July 9th, D-Day paratrooper Joe Morettini will visit the AMC Museum to reunite with the C-47 that carried him into combat in WWII. In April earlier this year, his fellow paratrooper Corporal George Shenkle of the 508th Parachute Infantry Regiment visited and spoke with enthralled visitors. Joe was not able to travel to Dover then but as one of only two or three surviving paratrooper who jumped from this C-47 on D-Day he wanted to make one last trip to see the plane that gave him a ride to France. The mission of his fellow paratroopers that day was to seize and hold the vital crossroads town of St. Mere Eglise, France, making it one of the first towns liberated during the invasion. Mr. Morettini will be visiting from 11 a.m. until about 1 p.m. The original jump manifest listing Joe’s name on it that will be on display on the 9th. 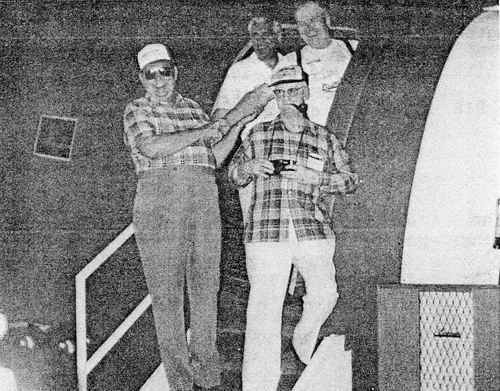 As a highlight Joe will add his signature to the National Star on the side of the plane just as he had done those many years ago. Photography is encouraged as this historic event will not likely be repeated. How wonderful! So wish I could be there today to represent our Dad, Col. T.E. “Ed” Yarbrough and be a part of the celebration today! Many a fond memory made at the squadron reunions and we hold dear and often revisit, comb through all of Dad’s D-Day memorabilia, his ‘ship’ manifest, orders, and D-Day photographs, etc. Theirs was indeed the GREATEST Generation. Mr. Morettini, I wish I could be there to meet you as Ed Yarbrough was my grandfather! Thank you for your service to our country! I am currently preparing to build a RC model of the Turf & Sport Special, with hopes it will be completed in time for the 75 anniversary of D-Day. Thanks again for your service and enjoy your visit!